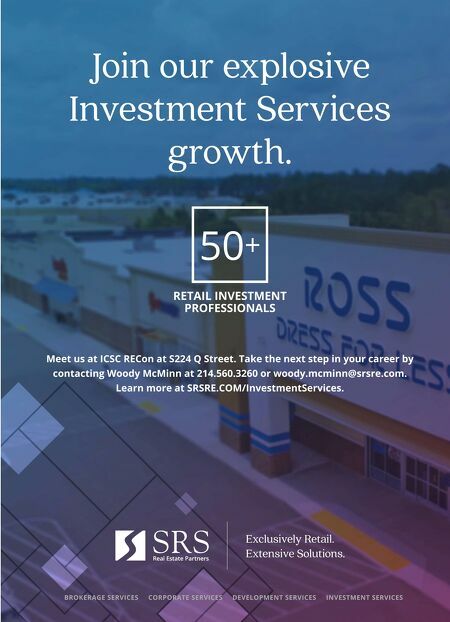 DEVELOPMENT NEWS 52 • SHOPPING CENTER BUSINESS • May 2018 RIDGELAND, MISSISSIPPI PACIFIC RETAIL CAPITAL BREAKS GROUND ON MALL REDEVELOPMENT PROJECT Southern California-based Pacific Retail Capital Partners (PRCP) has begun construction on the redevelopment of Northpark, a 958,000-square-foot enclosed mall in Ridgeland, about 11 miles north of Jackson. Plans for the first phase of the project include new public entrances, corridors, amenities, public restrooms and common-area gathering spaces. The renovation will include new interior and exterior landscaping and a complete resurfacing of the parking lot, public art from local artists, a new children's play area and a new family lounge with private nursing stations, baby-changing stations and a family restroom. In addition, the redevelopment will transform the mall's current food court into The Eatery, an open, café-style dining area that will feature interactive digital displays and new dining options. The first phase of the project is slated for completion in November. 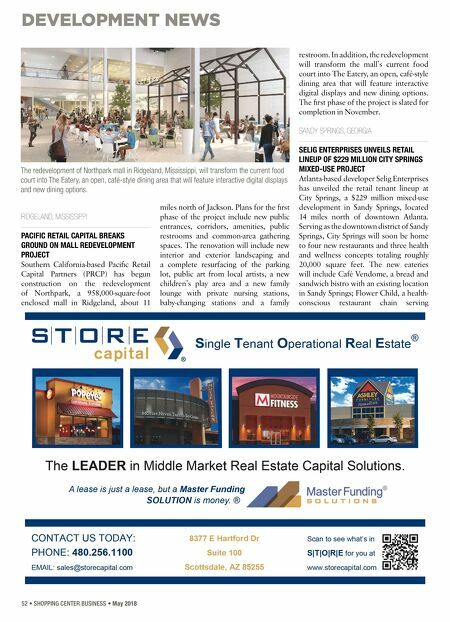 SANDY SPRINGS, GEORGIA SELIG ENTERPRISES UNVEILS RETAIL LINEUP OF $229 MILLION CITY SPRINGS MIXED-USE PROJECT Atlanta-based developer Selig Enterprises has unveiled the retail tenant lineup at City Springs, a $229 million mixed-use development in Sandy Springs, located 14 miles north of downtown Atlanta. Serving as the downtown district of Sandy Springs, City Springs will soon be home to four new restaurants and three health and wellness concepts totaling roughly 20,000 square feet. The new eateries will include Café Vendome, a bread and sandwich bistro with an existing location in Sandy Springs; Flower Child, a health- conscious restaurant chain serving The redevelopment of Northpark mall in Ridgeland, Mississippi, will transform the current food court into The Eatery, an open, café-style dining area that will feature interactive digital displays and new dining options.